There’s no shame in losing to the better man, as light heavyweight Tony Wilson learned in the third round of his fight with Steve McCarthy in 1989. What is shameful though is that Wilson’s mother, 62-year-old Minna Wilson, couldn’t bear to witness her son taking a beating any longer so climbed into the ring and began beating McCarthy around the head with her shoe, triggering a riot. Bleeding from the head, McCarthy left the ring and refused to return. As a result the referee declared that he had retired and named Wilson the winner. Instead of thanking his mother for her help, Wilson banned her from going to any more of his fights. 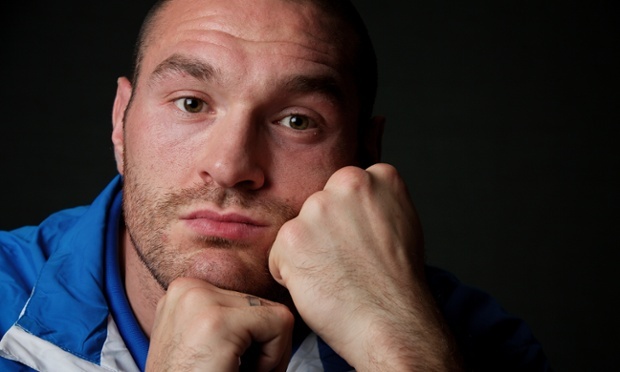 Everyone remembers this moment from Tyson Fury’s early days. During his fourth professional fight against Lee Swaby, the heavyweight contender became a bit overexcited. Not satisfied with his opponent’s performance, he started hitting himself to make the fight more of a challenge. Some advice for Fury’s future opponents: make him angry. The more angry he is, the more likely he is to become careless. And the angrier he gets the harder the punches he’ll throw. Stay the hell out of the way and watch a giant man knock himself out. He might forget you’re even there. Light heavyweight Brian Sutherland claimed he had never set foot in a ring before his first bout, so no one is really sure how the fight ended up on TV. Perhaps word of mouth landed him a spot on the show Tuesday Night Fights. Perhaps they couldn’t resist when he showed up with a reputation as a street fighter who had never lost, with an iron will and a haircut that says “don’t mess with me”. And he nearly lasted a full minute, before Liverpool’s Kenny Rainford bored of watching him hop around and hit him with his first, and only, real punch of the fight. He only needed one. This clip from Manny Pacquiao’s utter destruction of Ricky Hatton is marred only by the effect the loss had on the defeated man. Welterweight Charlie Zelenoff is boxing’s greatest internet celebrity. Despite losing his one and only fight, having been disqualified for repeatedly spitting out his gumshield, Zelenoff claims to be the pound-for-pound No1 and the greatest boxer of all time. He also regularly boasts about knocking out heavyweights with his “4500 psi” punches that he says pack as much power as a meteorite. He hit the headlines earlier this year when Deontay Wilder knocked him around in response to alleged threats from Zelenoff. He’s most famous for a sparring session with 59-year-old Mayweather, Sr. After crawling out of the ring, Zelenoff, 23, runs back in to sucker-punch a man more than twice his age. The Shadow (?-?-?) is so mysterious that there is almost no information about him on the internet apart from his fight with “Insane Zane” on Canadian Fight Network show So You Wanna Fight. The creator of “illusive fighting” may look a simple office worker but we are assured that he has undergone a rigorous training regime including intensive hiking, meditation and “dodging cars at busy intersections”. In practise, this is less impressive. The Shadow shows that he has little understanding of fighting or even of getting out of the way of big, hairy men. Maybe he would have done better if Zane had been a car. Jerry “Harm’s Way” Hackney was never going to be a world champion. He lost every single one of his eight fights and had one of the most terrible nicknames in boxing history. As if losing all of his fights isn’t embarrassing enough, he performed amazingly badly against George “Da Butcher” Klinesmith. In the fourth round, Hackney decides he has had enough of a beating so turns his ginger dreadlocks (always a great choice) and runs. He jumps on to the ropes, where Da Butcher “makes mincemeat outta him” by punching him into the crowd. Hackney claims he was “just jogging across the ring”. In 1997 Crawford Grimsley was a heavyweight showing promise. He had a history of impressive first-round knockouts and managed to go the distance against the legendary George Foreman. Grimsley was the real life Ivan Drago: a sharp, blonde knockout master. That is until his fight with Jimmy Thunder, in which he was knocked out almost immediately. If you squint it can be a really underwhelming alternative ending to Rocky IV. Paul Briggs was an Australian light heavyweight. His comeback fight against Danny Green lasted only 29 seconds as Briggs went to the canvas after the first punch. Which sounds like Grimsley, except this time the punch didn’t even touch him. Briggs was then booed out of the stadium while Green labelled his opponent as “less than canine.” Briggs was later fined $75,000, had his license revoked and had details passed to the police about the $100,000 bet placed on the outcome by Perth street gang, the Sword Boys. It was lucky for him that his opponent didn’t force him to hand over the money when he lost, as ringside after celebrating the win, Groves trainer Adam Booth, said “We’ll let James off the bet.” I hope he has the balls to double the bet for their inevitable rematch. Cuban Pedro Cardenas found himself in a tough spot at the final of the 1982 North American Boxing Championships. Caught against the ropes by opponent Willie DeWitt, Cardenas began swinging wildly in the hope of catching his opponent, but his fists find referee Bert Lowes instead, instantly knocking him out. Accidents happen, so a new referee was found and the fight went on. Cardenas soon found himself in the same position, desperate and against the ropes and manages to hit the second referee as well. Luckily, DeWitt finishes Cardenas soon after, to the great relief of any other potential referees and the judges, who could well have been on Cardenas radar too.